Inspiring the success of our youth, a great cause supported by CAE! Like many of you probably, I didn’t know what career to choose when I was in high school. A bit by coincidence and with a lot of doubts, I chose to pursue studies in Science, without really knowing where it would lead me. Through a series of meaningful encounters and events, I discovered Engineering and the Aerospace industry — a happy discovery! My story is not unique: each year, thousands of young people between the ages of 14 and 17 face a serious dilemma that will affect their futures. To choose a study path with advanced science and mathematics? To pursue postsecondary education? Which program to choose? To help them answer those questions, the organization Montréal Relève has been offering the Classes Affaires program since 2001. 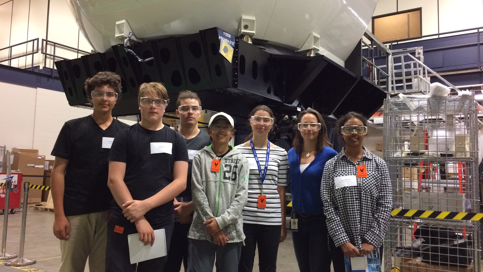 This program gives Secondary 3 and 4 students in the Montreal region the opportunity to visit companies in their chosen field. There, they can have a first learning experience in the workplace to help demystify this sometimes unknown world. CAE decided to support the initiative and on July 13, the company opened the doors of its headquarters to a group of 14 students from 11 different schools. With the support of Annie Vaillancourt and several other colleagues, I had the chance to welcome them for an action-packed day. On the itinerary: a company tour, interactive workshops, programming exercises, demonstrations, discussions with our employees, a simulator tour and trivia games. Questions and exclamations came from all sides. Are simulators made with real airplane cockpits? Why do you simulate the sound of an airplane? Who buys the simulators? And, last but not least, how do I become a pilot or engineer at CAE? The company’s noble mission, our huge simulators, the passionate of employees they met and... the PlayStation 4 (yes, really!) in the new office spaces won over more than a few. In a recent video, Marc Parent highlighted the importance of internships for training youth before they enter the workforce. In that vein, I was able to see just how much a simple company visit can open up new horizons for youth and inspire and guide them. Who knows, maybe this visit will help some of them when it comes time to make tough decisions about their study path, and even guide them into a future career in aerospace!